Late Monday, Carrier IQ began circulating a document (PDF) it claimed would answer all outstanding questions about the company, its monitoring software and its relationship with the operators. While the doc didn’t answer every question about Carrier IQ and the growing controversy surrounding its operator customers, it did go into detail about how its software, IQ Agent, works, even revealing a few surprises. Notably, the company revealed operators aren’t receiving the same generic performance and network metrics from every device. Every operator has the ability to tailor what information a phone sends on the fly, allowing it to set up ad hoc test cases targeting different groups of devices or consumers. In other words, an operator can shanghai your phone into a kind of virtual focus group to test a new product launch and possibly even research the viability of new services. For instance, if an operator wants to see how a new high-profile smartphone is interacting with its network, it can have every one of those devices send back detailed radio signaling data, which an operator could use to fine-tune future versions of the device. Or, if an operator expands an LTE network in a particular market and wants to optimize its coverage, it can order all LTE devices to send back specific logs on cell-to-cell hand-over and dropped data calls. Those are both examples Carrier IQ provided, but it’s not hard to imagine an operator using IQ Agent’s huge menu of available metrics to gather marketing data on their customers. Carrier IQ readily admits its software can track URLs visited, when applications are activated or deactivated or when IP data sessions begin and end. So if an operator wanted to test the viability of a new social media data plan, it could track how often a subset of its customers access sites or apps like Twitter or Facebook versus communicating via SMS. The operators have a lot of demographic data about their customers, which they could easily marry to the near-real-time device and network information it collects from IQ Agents. There’s a potential market research bonanza buried in that app. I’m not saying the operators are collecting this kind of market research on their customers, but the capability is definitely there, and Carrier IQ isn’t throwing up any barriers to accessing that goldmine. Part of the standard kit it provides to every operator is a Market Service Intelligent Platform (MSIP), which gives carriers a fine degree of granularity in determining what data to collect and how to analyze it. If an operator wants to implement a specific case study, it merely has to select the types of customers or devices it wants to gather information on – or even select individual customers – and the MSIP reaches out to devices, updating their IQ Agent profiles to start retrieving the relevant data. Of course, Carrier IQ wipes its hands of any responsibility for how operators use the platform, which to me sounds like a cop-out. It just gave the operators the gun; it didn’t tell them at whom to point it or to pull the trigger. In the U.S., AT&T(s T), Sprint(s S) and T-Mobile have all admitted to using Carrier IQ (Verizon(s vz)(s vod) does not), but all have stated they use IQ Agent solely for diagnostic and troubleshooting purposes. If we take them at face value, you could construe this kind of targeted monitoring as harmless. 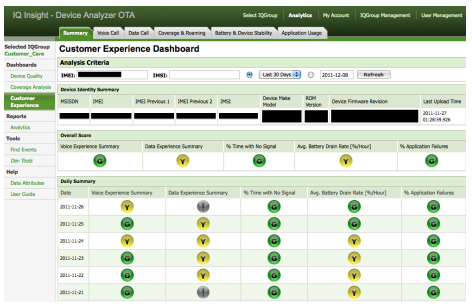 Carrier IQ gives operators the ability to collect hundreds of individual metrics from every device. But rather than sending massive batches of data from every device, they only need to collect the information pertinent to a specific optimization or diagnostic issue. Why fill up databases with billions of useless data points if you only need a few specific metrics? But these types of targeted analytics do escalate the creep factor of the Carrier IQ controversy. I’m already uncomfortable with the idea of my operator collecting data from my device without my knowledge, even if it is only for diagnostic purposes. If my operator is “activating” my phone at random intervals to serve in one of its ad hoc focus groups, then I would be doubly freaked out. I suppose I could accept this if my operator were more upfront about it and gave me the option to opt out. But if my operator is using all of Carrier’s IQ capabilities to turn me into an unwitting guinea pig for mobile market research, well, then it’s time to switch to Verizon, MetroPCS(s PCS) or any other operator that disavows Carrier IQ. There’s one other item in the Carrier IQ document worth noting: The company acknowledged it actually was sending some tex- message content back to the operators, but this was due to a bug in the software. When IQ Agent is set to track signaling data, it sometimes accidentally captures SMS messages, which are also transmitted over the over the network’s signaling channel. This only happened when an SMS was sent or received during a data session or voice call. In any case, the content of the SMS is still encrypted in the signaling log. Carrier IQ said it’s fixing this bug, but it’s a moot point really. If operators really wanted to read your text messages, they’d just intercept them as they passed through their own SMS routing infrastructure. While Carrier IQ’s document was highly detailed, it still didn’t address the issue of its non-operator relationships. Carrier IQ hinted at other business models in the document, but it didn’t come out and say whether it was distributing its IQ Agent at the behest of any handset vendors or independent research firms. Carrier IQ did say it wasn’t selling or sharing the operators’ data to any other entity, though it hosts some of that data on its own servers. But that still doesn’t answer the question of whether Carrier IQ is collecting information independently for other companies. Apple(s aapl) has already admitted to using Carrier IQ on the iPhone, and Nielsen (s nlsn) has some sort of data sharing partnership with the company. There’s also evidence Carrier IQ has shopped its platform to other research firms. The Yankee Group told us it considered buying Carrier IQ metrics at one point, but ultimately decided against it. While Carrier IQ is being transparent about the carrier side of the business, there’s still a big aspect of its business model that remains opaque.